Packaging produce has always been a key aspect of Horton Fruit’s success. Our founder, Albert G. Horton, was considered a pioneer in the pre-packing segment of the produce industry in the early 1950’s. That commitment to setting the standards and meeting the demands of the consumer continues today with our repacking operation. Repacking focuses on converting bulk produce to ready-to-buy products. Our repacking team continues to develop value-added package solutions designed to deliver produce to the exact size, color, and quantity requested. The Horton Fruit repacking process starts with hand selecting and packaging each order based on the customer specifications of the selected produce. Our repacking team personally sorts through each case of product to ensure customers receive only the finest-in-grade product. In addition, Horton Fruit will custom package your private label. Strong grower relations allow Horton Fruit to offer tomato solutions for every type of customer. Tomatoes are available year round in all varieties. We grow our own round and roma tomatoes 6 months a year. Custom packing and distribution flexibility enhance our services to maximize customer and consumer satisfaction. Horton Fruit repacks Red, White, Yellow and Sweet Onions year round. We take the best onions available and manage strict specifications to supply retailers and foodservice operators throughout the Eastern United States. We can pack any size order in your label or our own Peak Brand. Recognizing the recent boom in the avocado business Horton Fruit has a dedicated team that focuses on developing custom packed value-added products for its clients. Horton Fruit offers a comprehensive avocado program by ripening to exact customer specifications. We offer all sizes & packs of conventional, organic, and bagged avocados. Horton Fruit uses the best-colored peppers from around the world to create our premium Stop and Go pepper pack. 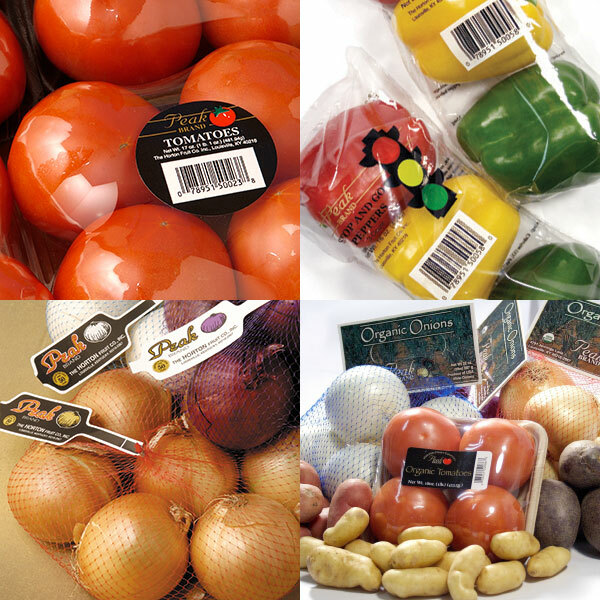 Our unique packing methods and specially designed bags enhance the quality and shelf life of the finished product. We are able to private label and can customize a pack in order to satisfy the ever-changing consumer demand. In addition to the Stop and Go pack, we repack pepper varieties like Banana, Anaheim, Poblano, and Serrano. Horton Fruit also repacks green bell peppers in 3 packs & 6 packs. Our facility can accommodate any type of organic request. Private label packaging is also available. The demand for organic produce continues to grow. Horton Fruit is a certified repacker of organic fruit & vegetables and is audited by Eco-Cert annually. Horton Fruit repacks organic onions, tomatoes, potatoes, and avocados.